Detail Produk "HPLC CECIL INSTRUMENT SYSTEM UK"
Whatever your HPLC requirements, Adept HPLC will provide great value plus more. Because the systems are modular, different detectors may be accommodated depending on analytical requirements. These detectors include variable wavelength UV/Visible, WaveQuest UV/Visible ultra-fast scanning, electrochemical, refractive index, conductivity and fluorescence. Each detector is of the highest industry specification and is renowned for its Ultra-Low Drift. If required, extra pumps such as semi-preparative and biocompatible, may be acquired at any stage. 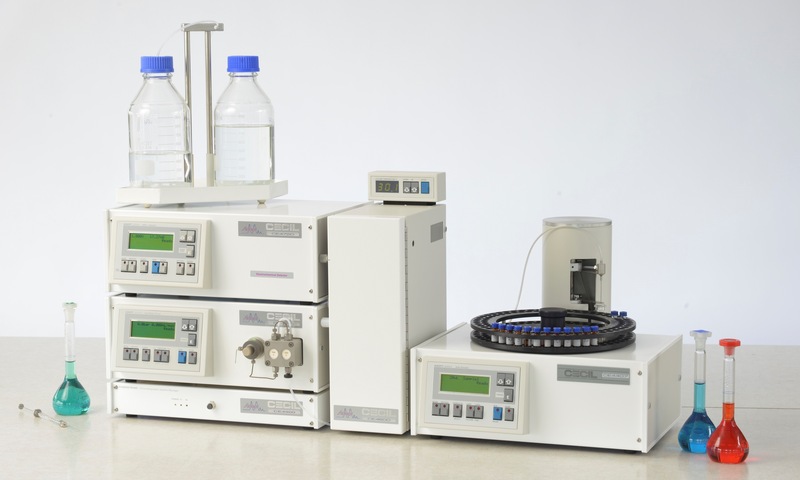 A wide range of autosamplers, fraction collectors, column heater/chillers, column reactors and column switching valves may be included in an Adept HPLC system. Each Adept system can be customised to an analytical requirement. The use of post-column reactors for amino acids, aflatoxins and barbiturates is easily achieved. The use of biocompatible options brings a streamlined approach to denaturing DNA, semi-preparative proteomics HPLC etc. Analyse catecholamines in blood plasma with an electrochemical detector, whilst simultaneously analysing anions using a conductivity detector. Detect all organic acids in wine using the conductivity detector, whist simultaneously detecting the sugars with refractive index or electrochemical detectors. Using the pulse-free microprocessor controlled pumps, achieve precise control and repeatability of mobile phase mixtures, to 0.1% levels. Coupled with rapid responses to changes in concentration and lower incidences of bubbling of the mixed mobile phase, the achieved gradients are the best. This makes method development and method transfer reliable and less stressful. All this provides for easy operation. PowerStream Software also provides 21 CFR part 11 Compliance. PowerStream, developed to operate in Windows facilitates organisation of chromatography results and methods and provides digital control for a wide range of peripherals. Operation is remarkably easy and help screens provide a complete operating guide. Comprehensive integration parameters are provided for accurate peak area and height calculations. Retention times for all peaks are tabulated. The clarity of screen presentation is illustrated by the composite display shown for a typical gradient elution. Method creation is simple and convenient. Firstly select all the hardware to be used for the experiment and add any of the following parameters as required: Timed events, Integration parameters, Calibration curves and Reporting parameters. PowerStream is the powerful new chromatography software, developed by Cecil Instruments R & D, for HPLC system control and data processing. It is used in conjunction with DataStream software, also developed by Cecil Instruments, to provide data transfer and comprehensive display, processing and manipulation of spectral scans. CE 4900/CE 4900D PowerStream system control and data processing are required. When system control is not required, PowerStream CE 4901 is provided, with an interface module without the control feature. Personal Computer with Pentium class processor. Microsoft Windows XP, Vista, 7, 8, 10. 512 MB of RAM or more. Hard-disk space required: 150 MB. Monitor resolution 1024 x 768 or better. Microsoft Mouse or compatible pointing device. 365 x 290 x 140mm, 7.5kg. Programs may be entered to change parameters, operating modes and select up to 6 different wavelengths in any time sequence. Four-line display of parameters, menus, prompts, wavelength, Absorbance etc. Two Absorbance outputs and Absorbance ratio to recorder. All data available to PowerStream System Manager. Four line display of parameters, menus, prompts, wavelength, Absorbance etc. 50 Watts, 100-240 V, 50/60Hz. 390H x 118W x 220D 6.4kg.